We are happy to say that more and more people every day acknowledge the importance of website security. Also, more and more digital agencies and web developers turn to find a partner in security and therefore are improving the service they are offering. With the rising issue of cyber attacks, people understand that they need to make sure they wouldn’t be the next victim, especially now when GDPR has been taken into effect. So the question is – how website security increases your revenue as a digital agency? We have the answer – make it as a channel for extra profit. It’s definitely easy to explain why it would be a good way to gain extra revenue. What customers think about security? According to GlobalSign research about the importance of SSL security when it comes to customer confidence the findings were pleasant. As you can see below 48% of the visitors check for security indicators on the website before giving any personal information. What more 21% of the customers check for security measures every time they visit a website and only 2% of them never pay attention to it. 24% of visitors check for security layer before purchasing and 5% check the security indicators when the site look fraudulent. So what does it mean? 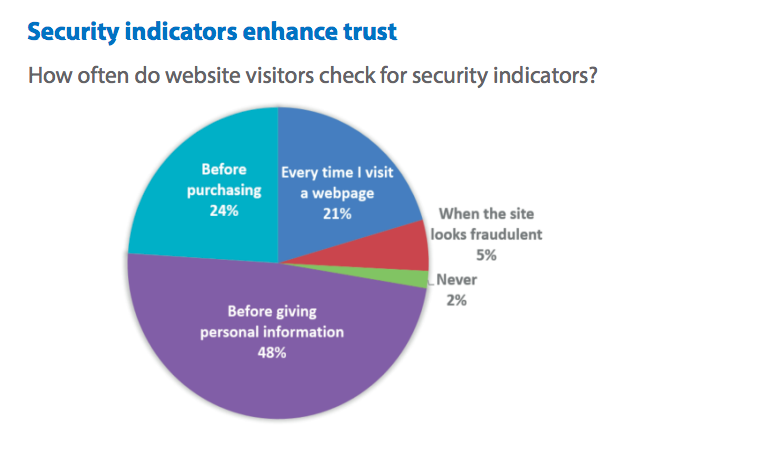 It means that over 9 out of 10 users are more likely to trust a website if it displays security indicators. And also they are more likely to leave details or purchase when they know that their data is sent over a secure connection. Google boosts ranking on secure HTTPS sites and decreases sites that run on HTTP. That means if you have a TLS certificate Google will rank you higher than your competitor on its search engine. Which means in the end, having a security layer for transferring information securely will bring you more customers and revenue. Like Google itself says – “Security is a top priority for Google.” Apart from HTTPS, Google is making sure that websites people access from Google are secure. If the sites have been blacklisted or marked as insecure, Google will let users know. Read more how does it work here. According to the studies – if a person who knows even a little about website security, he or she will look for an agency who focuses on website security. So, therefore, offering security-related options for your customers will gain more trust for your agency. Why is website security important for your clients? If a potential customer visits your website and gets malware from your site, they likely will not be returning. Which means that one website attack can mean an enormous revenue loss for a company. The time and amount of anger and frustration that will go into the remediation after the hack happens is additional immense energy and time if you do it by yourself or not with the help of professionals. Read more about what happens when websites get hacked here. 1. Move all client’s websites over to HTTPS – read more about it here. 2. Make sure you have a full overview of your websites all the time. Uptime monitoring, activity logs, security alerts. 3. Add protection to all your websites. There are many providers, choose the one that speaks to you the most, but make sure you do the research to find out which website security provider suits you the best. If you’re an agency, choose the one who focuses on you. If you’re having a complicated application, choose something personal or talk to security consulting firms.